It's the dead of winter, it's been cold and snowy here in the city, and our terrace is still covered in scaffolding. So, planting is hardly happening in the near term. But I must tell you about a great gift I received a couple of weeks ago. 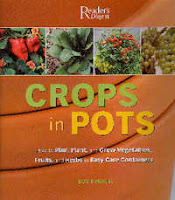 My friend Renee came up from D.C. with a belated birthday present: Crops in Pots, a book by Reader's Digest. I know, you're thinking Reader's Digest, not cool. But let me tell you, there are tons of great planting ideas in this book. I have been thinking about branching out, doing some lettuce, cukes and other veggies to complement the tomatoes, peppers and eggplants we've been growing the past few years and this book gives pointers on how to grow all those plants and more in pots on the terrace. So, when the warmer weather comes (and if the building finishes the construction by the spring) I am going to be ready to start another great growing season!